Health Facilities Group is proud to support the United States Air Force at its oldest continuously operated military base. While designing for this project, our architects had the opportunity to travel to F.E. Warren Air Force Base’s beautiful location outside of Cheyenne, Wyoming. Antelope and prairie dogs frequent these plains and a mountainous backdrop rises on the horizon of the Base. This vivid imagery inspired HFG’s designers to draw upon local scenery, as well as Air Force culture, while envisioning Warren’s new Medical Clinic and Veterinary Clinic. In the Medical Clinic, etchings of distant mountains will line the top of a wall in the main corridor. Similarly, the Pediatrics Unit will feature a mural of local wildlife, including antelope and prairie dogs. Warren’s Wyoming location has also informed functional design elements of our structures. In response to the region’s winter extremes, HFG designed windscreens to flank the entrance of the Veterinary Clinic. But rather than create utilitarian screens, our designers fashioned panels laser-cut to feature military working dogs. With their painted powder coat finishes, these precision metal screens will create a dynamic contrast to the ruggedness of the surrounding plains. For finishing touches, HFG has tapped into the local beauty of F.E. Warren Air Force Base in order to ensure that America’s service men and women receive the very best. Health Facilities Group is providing F.E. Warren Air Force Base with architectural services for a Medical Clinic Renovation that will feature an “on stage / off stage” organization. This design provides superior patient and staff privacy and reduces travel distances. 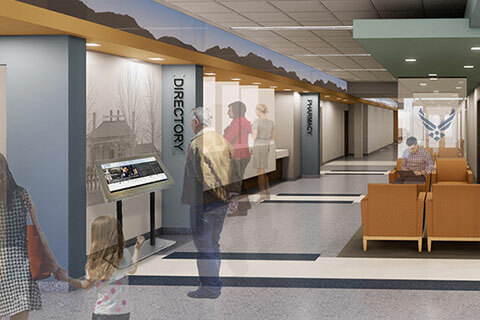 Within our “Main Street” retail concept, departments with the highest patient volumes are relocated closest to public entrances and all relocated clinic services can still be located by direct visual access and coordinated colors for optimized wayfinding. The Clinic also features divided reception and pharmacy pickup stations in order to improve HIPPA compliance and retracting security gates for security. HFG is also designing an Ambulance Garage Addition and a new Veterinary Clinic for military dogs and companion animals. The Veterinary Clinic is designed to increase awareness on base of the service animal offerings available to military personnel. Finally, HFG is designing a Temporary Phasing Facility (TPF) in order to ensure that operations remain uninterrupted throughout Medical Clinic construction.